When it comes to his golf game, Maxim Lapierre isn't exactly a giant on the links. But when it comes to his hockey career, the feisty Montreal forward is as competitive as they come. The 2009-10 NHL regular season, on a personal level, was not what Lapierre had anticipated. But the Quebec native, who recently hosted his second annual golf tournament, is eager for the new campaign to get kick-started, one he hopes is nothing like last year. Projected to be in a dogfight for a playoff berth in 2009-10, the Canadiens, who finished fourth in the Northeast Division, made it all the way to the Eastern Conference finals before bowing out in five games to the eventual Stanley Cup runner-up Philadelphia Flyers. For his part, Lapierre, who had surgery on his ankle last summer, contributed three goals and one assist in Montreal's spirited post-season run. It was his highlight-reel, game-winning tally in Game Six that propelled the eight-seeded Habs to an eventual seven-game series triumph over first-seeded Pittsburgh in the opening round. “You never count a guy like Max out,” offered teammate Mike Cammalleri, after Lapierre's key goal. Blessed with an ideal blend of speed, size and strength, there is a certain tone in Lapierre's voice that suggests the centreman is hardly on the ropes, trying to fight his way back to form. Instead, the 61st overall selection in the 2003 NHL Entry Draft sounds quietly confident, but not cocky. “It's been a summer of training, that's for sure,” laughed Lapierre, who played his first NHL game on November 15, 2005 against the Florida Panthers. “Summers have always been that way for me. I want to be in top shape when camp begins and carry that momentum into the season. During the 2006–07 season, Lapierre was brought in to replace injured defenceman Mathieu Dandenault, and excelled, contributing three goals and one assist. He was subsequently sent back to the Hamilton Bulldogs, Montreal's American Hockey League affiliate, after Dandenault returned from his injuries. Lapierre was later recalled to NHL duty, but when the Canadiens missed out on the playoffs, he returned to Hamilton to help Hamilton in the Calder Cup playoffs. 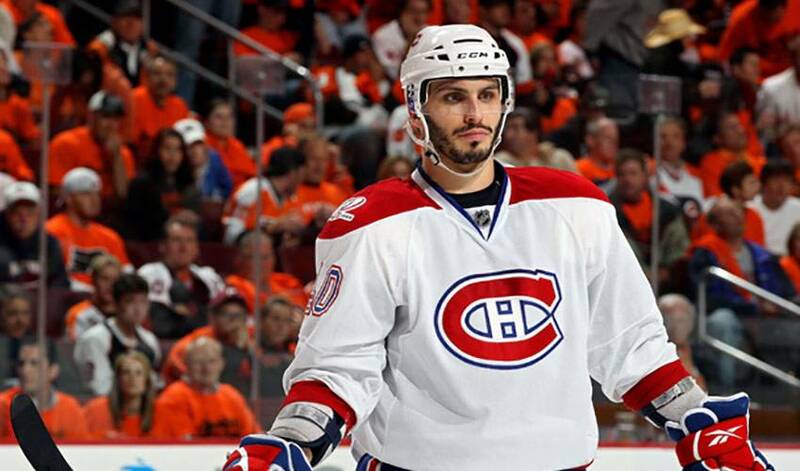 In late 2007, he was recalled to the Canadiens and has been playing ever since as a third and fourth line centre. Lapierre notched a Gordie Howe hat trick (goal, assist and fight) against the New York Rangers on December 4, 2008. Later in the season, on December 29, 2008, in a game against the Florida Panthers, Lapierre recorded his first career NHL hat trick. Delivering strong numbers, like the 15 goals he posted in 2008-09, and taking another shot at Cup glory, top Lapierre's wish list for 2010-11. While he's determined to take his own game to another level, Lapierre did find time before the hockey season gets into full swing to try out his golf swing for a good cause. Lapierre was joined by teammates Mike Cammalleri, Scott Gomez, P.K. Subban, along with Montreal alumni, including Mario Tremblay. Rather, Lapierre's main focus is making sure he and the Habs keep par with their Eastern Conference rivals.